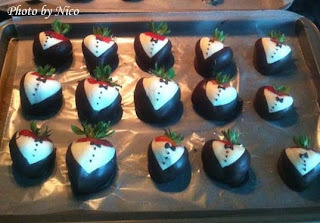 Remember those very cute, very delicious tuxedo strawberry men that I ate for dinner here? Well the very creative gentleman that created them has graced us with our very first guest post and the how-to on these cute little treats. Enjoy! Hello all, my name is Níco. I love cooking and food preparation just because it allows you to literally fill people with the love you put into the food you offer them – and this recipe offers a unique opportunity to not only cook love into your food, but to even dress your food up with love. Although it takes a little extra time, this recipe (or preparation, to be more precise) is as fun as it is rewarding. It will make the love you feel for the special person (or people) you are preparing it for both palpable and well presented… after all – who doesn’t love a nice tuxedo? After having washed and most importantly, DRIED the strawberries, place the white and dark chocolate in a 2 large bowls (separate, of course). Then place the wax paper on a cool counter top surface or on a cookie sheet. Next warm the white chocolate for about 30 seconds at a time in the microwave, stirring very well between warming intervals… Remember – this is a labor of love… white chocolate is very temperamental, but if you take your time with it and warm it slowly then it will be smooth and beautiful… if not it can burn, and believe me you’ll know if it does! 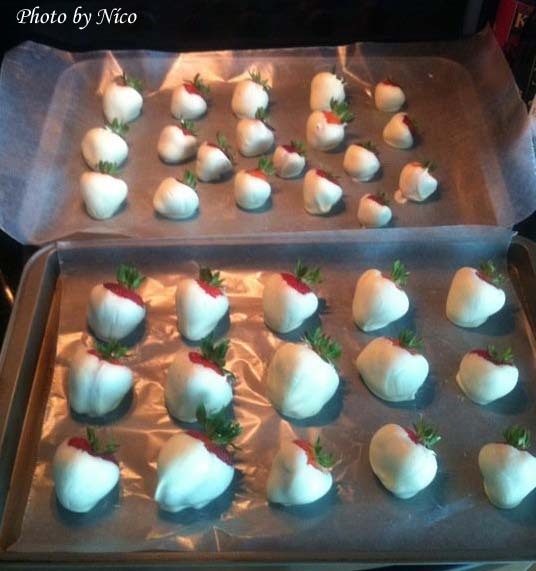 Once it is smooth simply take each strawberry gently by the stem and slowly dip it into the white chocolate, but leave a touch of strawberry showing for presentation, placing each one on the wax paper to cool. 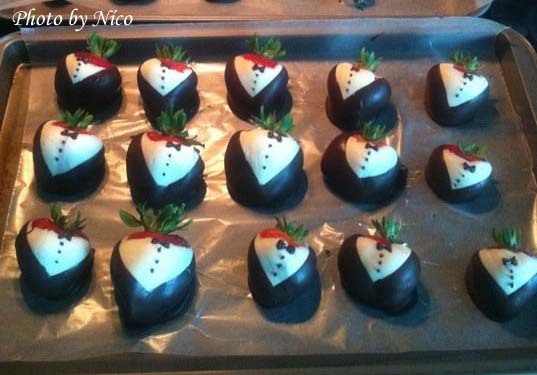 ﻿Once you have given each strawberry its shirt, the next step is to give them their coat. Warm the dark chocolate in the same way as the white, however this chocolate is not nearly as formidable an obstacle as the white. Do remember, however, to save some for the next step. 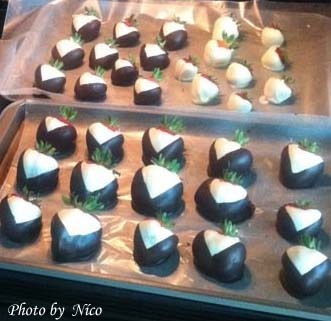 Now you simply dip each berry in the same way, but this time creating a V shape showing a significant portion of white on the front of the berry and covering the back with dark chocolate. Finally, we must give our men their studs and bow ties – this is done by warming some of the dark chocolate in a Ziploc bag at 10-15 second intervals and gently massage it in between. Be sure not to press to hard or it will get everywhere! Then cut a very small part of a corner off and use it to dot on the studs and draw an X above them, closing the ends to make bow ties! 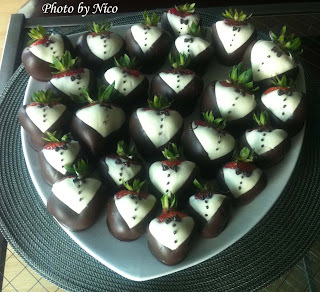 Strawberry men in Chocolate Tuxedos! ﻿I hope you all enjoy and can share this with all of your loved ones. I hope you all enjoyed our first Guest Post! We will see you back here on Monday for "Monday Funday". Have a yummy weekend! Soooo cute!!! Too bad I don't like chocolate I might make these just because.